What if they held a world championship and no one showed up? The World Speed Shooting Championship, aka Steel Challenge is happening this weekend. The last time I was able to get numbers, there were fewer than 30 entrants in the match. Report from the “on the ground” indicate that there isn’t even a super squad. I’ve talked about how USPSA is killing Steel Challenge, and the reports I’ve been hearing about the match in Utah aren’t filling me with lots of confidence. Let me be absolutely clear: Steel Challenge is an important match, and an important part of our sport. We should be trying to preserve it, not banish it to die in the desert; which I suppose an improvement over dying in the swamp. Here’s the thing. The last two years for Steel Challenge saw declining attendance and sponsorship. I believe that 2014 is the make-or-break year. If there are fewer than 100 shooters at the main match, USPSA should just pack the match up, and sell it to someone who cares about it, so they can begin the process of growing it back. It’s a sad testament that the best Steel Challenge-Style match right now is the US Steel Nationals held in Titusville, and not the “world” championship. I’m not in Utah this week. I’ll be reporting on the match with updates from friends and shooters who are in attendance. If you’re at Steel Challenge this week and would like to share your thoughts, email them to us at [email protected] and I’ll publish them as we go! Can Steel Challenge be saved? This is where we’ll find out. The West Coast steel challenge match in Piru is alive and thriving… They shouldn’t have left california in the first place. They are no longer a Steel Challenge match. They’ve tweaked the stages, in particular most of the harder shots are gone (and that was the intent according to Jim), only one box per a stage, and hoser stages are gone. I don’t know what to say other than this is sad. I know that Steel Challenge can be saved, Bianchi Cup was saved, it just needs someone with a true love for the event and a vision. There is a thriving, and growing, steel scene in Eastern Pa. There are 30 million people who live within a 5 hour drive of the Philly area. PA is still gun friendly and there is no shortage of facilities that could host a national event. USPSA did no advertising about the St. George match. I’m a life member of SCSA and have shot the Steel Challenge when it was in Piru starting in the early 90s until it moved to the swamp – but I don’t remember getting any info about the event, certainly nothing like the old marketing materials Mike and Mike used to send out to promote the match, which included a lot of info about the size of the prize table — which was part of the appeal of the match. Part of what made it cool was that you could get IDPA, SASS, ICORE, Bianchi and IPSC types together. It seems like USPSA has stopped all that outreach completely and tried to make it purely for IPSC shooters, which is a mistake. Part of the problems is that nobody at USPSA headquarters was ever a regular at Piru. The match doesn’t mean as much to them as it did to those of us who went every year. USPSA doesn’t seem to have a clue about marketing. I got the new “annual guide” to USPSA and the cover is Taran Butler shooting 3 gun, wearing $10K worth of hardware. No better way to recruit new shooters than to show someone shooting exotic, expensive guns totally different from what’s in their closet. Steel Challenge has appeal because all you need are a couple mags and a holster – the growth of Scholastic Steel Challenge is a good example — but USPSA and NSSF had some sort of split over that, and USPSA ended up the loser in that deal. I like this comment so very, very much. The problem was that few of the matches I’ve shot had enough people show up for the IDPA and SASS divisions to require awarding even a single plaque. So I see why Phil cut them out. As having them in made it so Steel Challenge MDs had to understand the equipment rules from three or more separate rule books. Moving to IPSC or USPSA divisions (with rifles added in) simplifies things. With exception of the ultra rare SASS shooter, there is a division for every pistol from IDPA except perhaps CDP unless they download to minor. It goes back to the original concept of the match: to create something that was pure shooting, where most of the equipment issues were eliminated, that could draw participants from a wider spectrum. Instead of shutting down those other divisions, a better approach would have been to push to expand them. You won’t grow the match by advertising it to fewer people. They should be working with Scholastic Steel Challenge to have the USPSA Steel Challenge be an SSC event, for example, but politics and feuding (apparently) between USPSA and NSSF over junior programs are preventing it. They should coordinate with Ruger Rimfire Challenge and somehow tie that in. Bring back the shotgun and rifle side events. More events, wider base means more potential sponsors, more awareness across a wider range of shooting sport competitors, and so on. Reach out to the international shooters – who used to be a bigger part of the Piru match – and find a way to get them coming back. 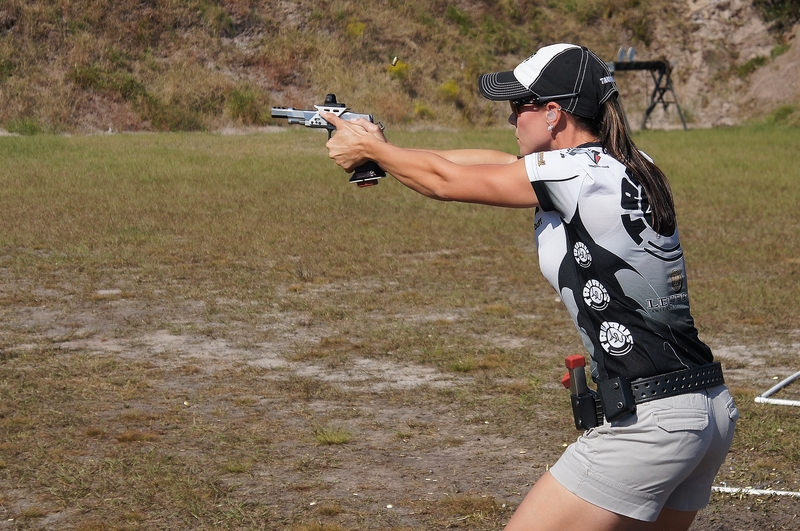 It’s all a low priority – a distraction – to USPSA which is much more focused on 3-gun right now, IMHO. Everybody thinks the “buzz” is about 3 gun. I teach classes almost every weekend, mostly to people that are “regular” shooters and CHL holders, a few of whom are interested in competition. 3-gun is a buzzkill because you need $5K worth of gear to show up. Steel Challenge is accessible to juniors with .22 (USPSA and IDPA is not, and neither is 3-gun). It’s accessible to people that have a few mags and a carry holster –even moreso than IDPA. Letting it die is a mistake for the future of the sport and for promotion of gun rights in general. It’s sort of funny how hard USPSA is chasing 3Gun, because their chance to be an influence in the 3Gun scene sailed years ago. Why they would have it in St. George, Utah during June is beyond me. It is going to be over 100 degrees this week and bright sun. They should have it in the fall or spring when the weather is beautifully mild. Now that the match is run by USPSA, the match location and date is set to please the USPSA RO cadre’s desires and schedules, working around Area matches and Nationals. When Mike and Mike had it, it was in August every year, but for many coming to Piru from warmer or more humid places (most of the attendees were from California, Arizona, Texas, and Florida), August in So Cal was “beautifully mild”. August in Piru ain’t bad, to be honest. I’m from not far from there, and it could have been worse. It could have been in July. Regardless of the other issues, I think the shooting sports do well to avoid California for any national or regional matches given the anti-gun legal/political climate there. Frank Glover is starting Steel Challenge matches at the Range. He’s certainly no stranger to running large matches, and Oxford is definitely more accessible than Frostproof or St. George. A motivated group might see that as an opportunity to at least try to get something bigger going there. People already come to his range from NH and south Florida for the Cup. I’ve never been to Oxford, but I’ve been to Frostproof several times. It isn’t this hell hole that people make it out to be. Frostproof is a 90 minute drive from one of the busier airports in the United States. There are plenty of hotels, and other attractions in case you bring your family. And as long as you don’t come during the summer with the rainy season the weather is quite good. On top of that USA has a great facility with fantastic staff to build and run the matches. There is a reason that a majority of the major matches in Florida happen at USA, and even when comparing it to Area 6 as a whole USA probably has the most major matches of any facility in Area 6.